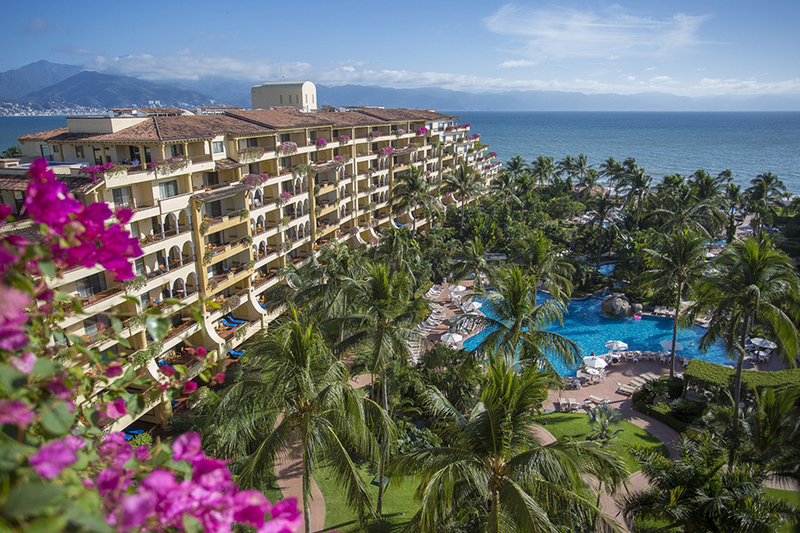 Facing the blue Pacific Ocean, Club Velas Vallarta is Puerto Vallarta’s best all-inclusive resort, ideal for family vacations, couples, and guests of all ages. Its grounds and generous, unlimited All Inclusive plan are a firm favorite among travelers, many of whom return year after year. 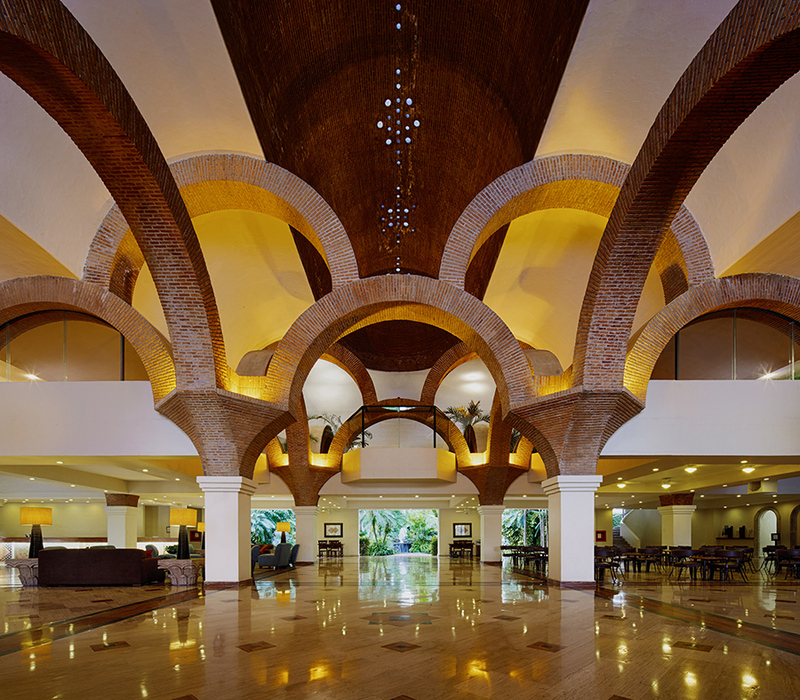 Club Velas Vallarta has been named an RCI Gold Crown Resort and awarded RCI Excellence in Service. Surrounded by tropical vegetation, the resort has three pools, a state-of-the-art gym, a rejuvenating spa, extraordinary restaurants with options ranging from gourmet selections (international cuisine served a la carte) to an ocean-front bistro, a cozy lounge, live music, modern Kids’ Club, family activities, tennis courts and suites with views of the ocean and unforgettable gardens. 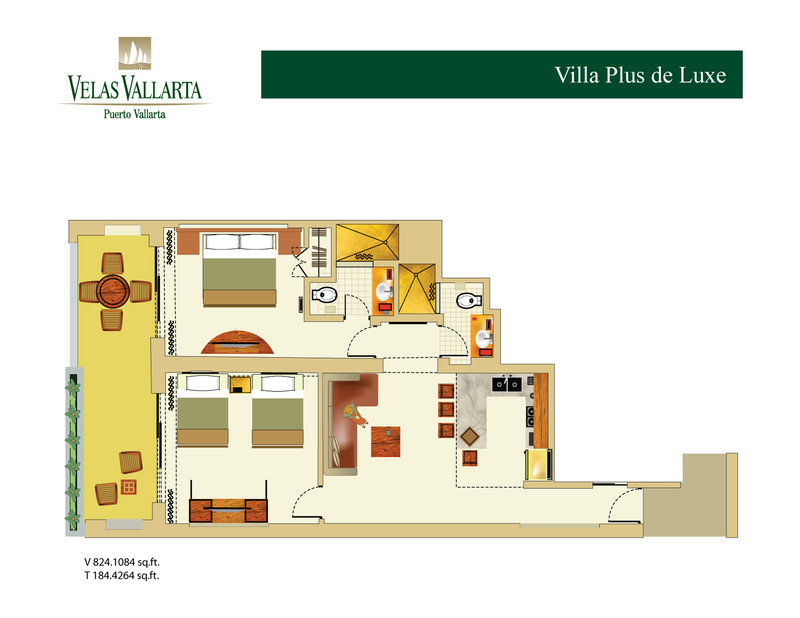 Located in the Marina, a few steps from golf and a few minutes from the downtown area of Puerto Vallarta, an infinite variety of attractions, beaches, activities and tourist sites are easily within reach. 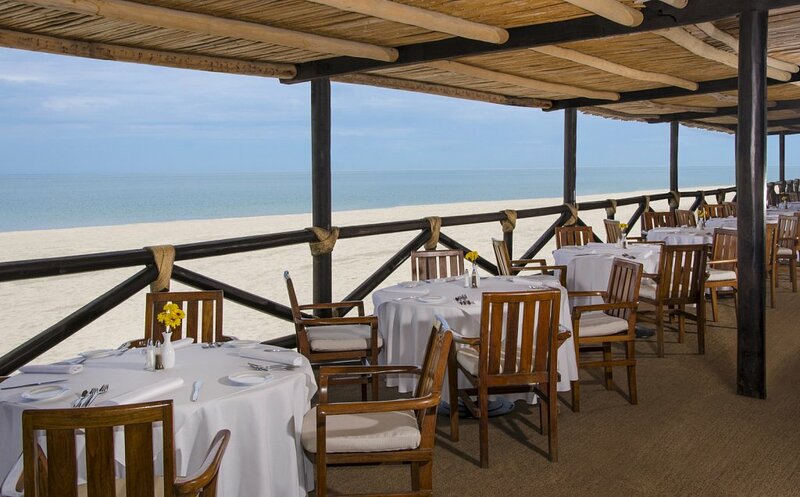 Gourmet a la carte or buffet dining at restaurants Andrea, La Ribera Steakhouse and Alejandra (seasonal). 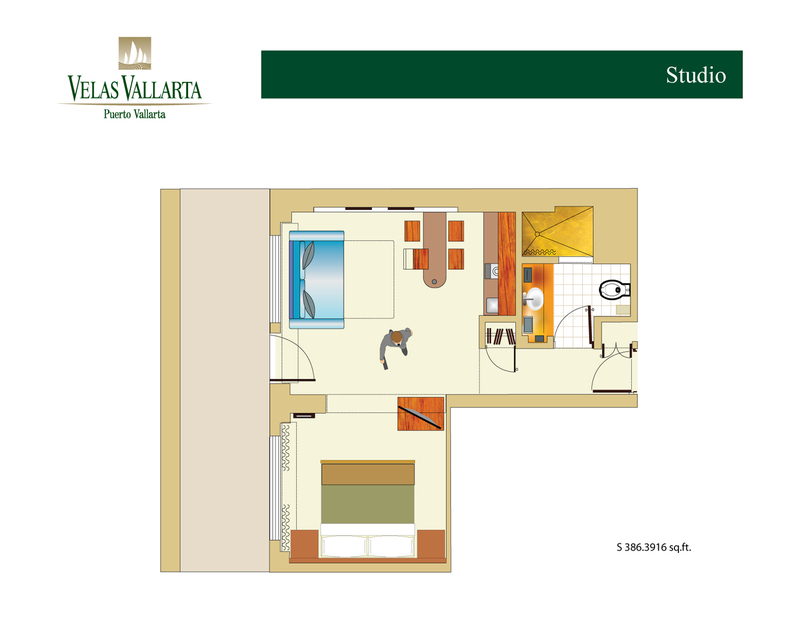 2 and 3 Bedroom Suites with refrigerator and pantry stocked with 20 convenient items. Airport pickup service (airport-resort). 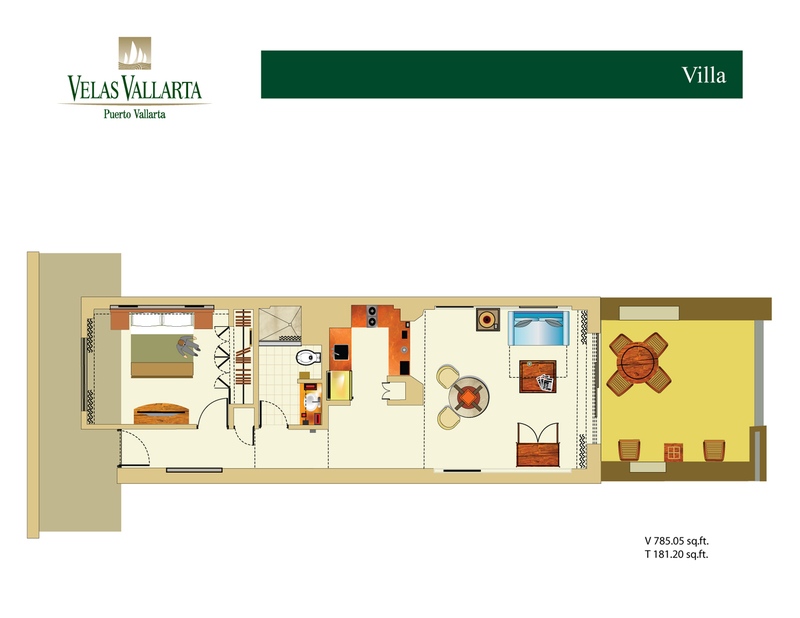 Send arrival information to guestservice@velasvallarta.com. Indulge in luxury and grand comfort in magnificent, beautifully-appointed accommodations overlooking the emerald waters of Banderas Bay. The resort offers a total of 345 studios, one-, two- and three-bedroom suites, as well as Master Suites and Ocean Front Suites. Each spacious option offers plenty of room to spread out and relax with family or friends, with tropical-inspired décor, contemporary furnishings, and an array of lifestyle enhancing amenities. Our studio suite is the perfect retreat for couples or smaller families, with a king-sized bed or two single beds. The living area with pull-out sofa bed and kitchenette give you all you need to feel at home. Our one bedroom suite has a private balcony with ocean views, and separate living areas to give you room to stretch out and relax. Guests have the option of one king sized bed or two single beds and each suite has a dining area and living room. This is a beautiful, breezy retreat for couples and families. Our two bedroom suite gives guests two private bedrooms along with plenty of shared space. The living room is spacious and leads to the private balcony that overlooks the waters of the Pacific Ocean in Banderas Bay. 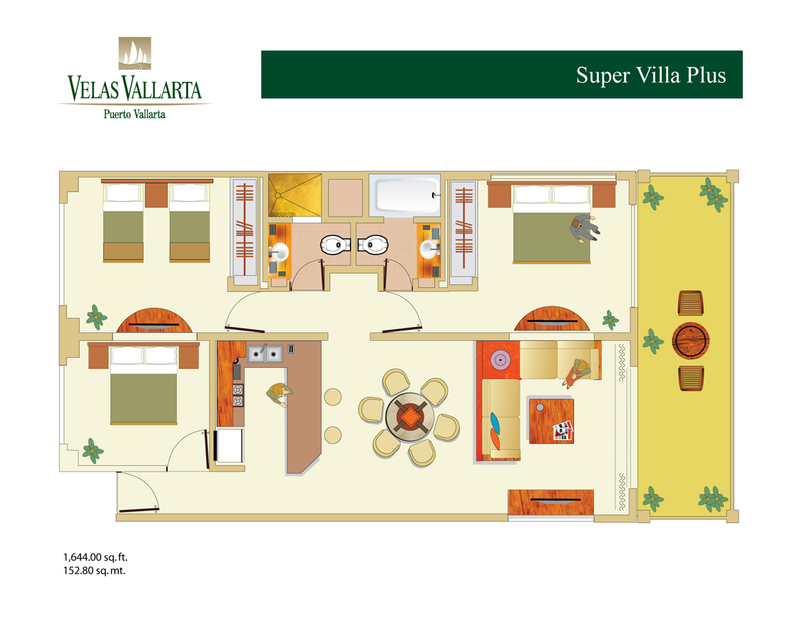 This suite is ideal for families or groups vacationing together. Our three bedroom suite is a spacious option for large families and groups to relax and enjoy the beautiful atmosphere. The three private rooms come with the option of one king-size bed, one queen-size bed or two single beds and the separate living areas are roomy and airy. Guests have the option of a private terrace with ocean views or garden views. Luxurious amenities round out the experience. Club Velas Vallarta offers a variety of daily activities and options for relaxation and entertainment for children and adults within the resort, including water aerobics, beach volleyball, and expansive programs of seasonal activities. Kids ages 4-12 will love the modern Kids’ Club, while adults can opt to play a round of golf on tropical world-class courses or a game of tennis or basketball. Experience an ocean-front massage to the sound of the rolling waves, plan an exciting tour of the local area, or simply relax in a lounge chair by the pools or on the beach with a refreshing beverage. Discover total balance of mind and body in the tranquil ambiance of our Spa. Browse our Spa menu to select healing, rejuvenating massages, facials and more to soothe your senses. Our luxurious spa features three indoor treatment rooms for massage, a hydrotherapy area, sauna, room for facials, and a Beauty Salon where guests can enjoy complete hair care, style services, waxing and foot and hand care. For the ultimate in relaxation, visit our outdoor Spa facility located on the jetty above the gently rolling waves. 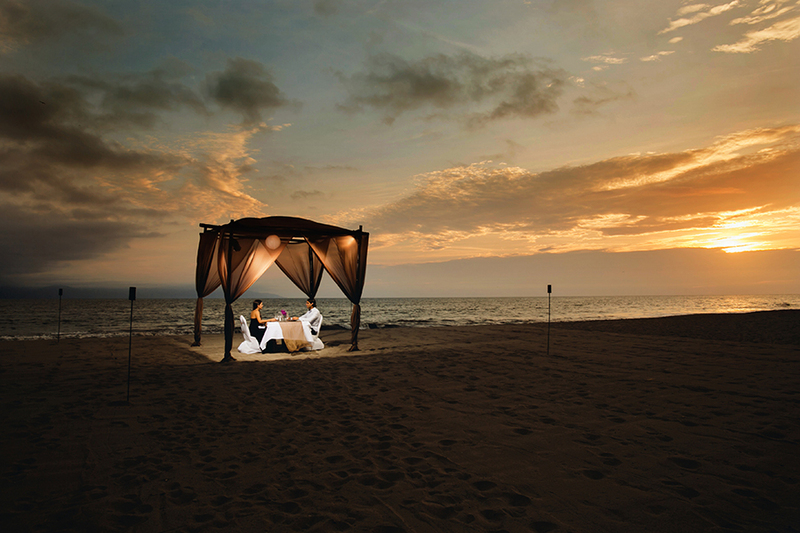 Experience a private massage or romantic moonlight Spa experience with your partner. Just minutes from Velas Vallarta you will find spectacular golf courses, including the Marina Vallarta Golf Club with 18 holes and practice facilities for beginning to advanced golfers. Vista Vallarta Golf Club is also close by, with two courses designed by Jack Nicklaus and Tom Weiskopf in a sublime tropical environment. Offers a lavish breakfast buffet and delicious lunches with a variety of gourmet a la carte items, as well as themed dinners, in a casually elegant environment with impeccable service. Dine indoors or on the terrace, and savor Asian specialties with an artistic touch or marvelous Italian dishes; fresh fish and seafood, salads and sandwiches as well as an extensive wine list. 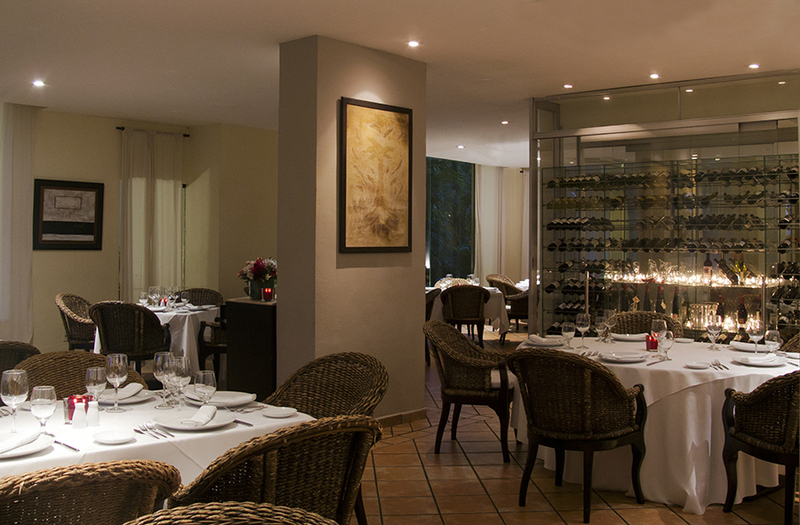 Innovative haute cuisine served a la carte in an elegant, stylish environment. The chefs at Alejandra create a tasty fusion of contemporary Mexican cuisine and internationally-inspired dishes, artfully prepared and presented, accompanied by live music and a dance floor. Ideal for a romantic evening of dinner and dancing. Serves delicious Mexican, Spanish and international cuisine, including fine cuts of steak, fresh seafood, delicious gourmet burgers, sumptuous salads, mouth-watering ceviches, and authentic Mexican dishes. 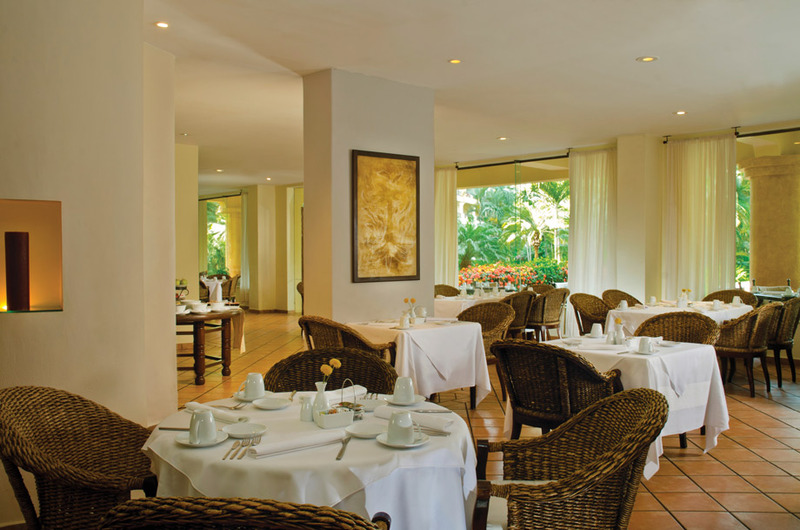 La Ribera also offers a bountiful breakfast buffet, a la carte lunch, and specialty and themed dinner menus. 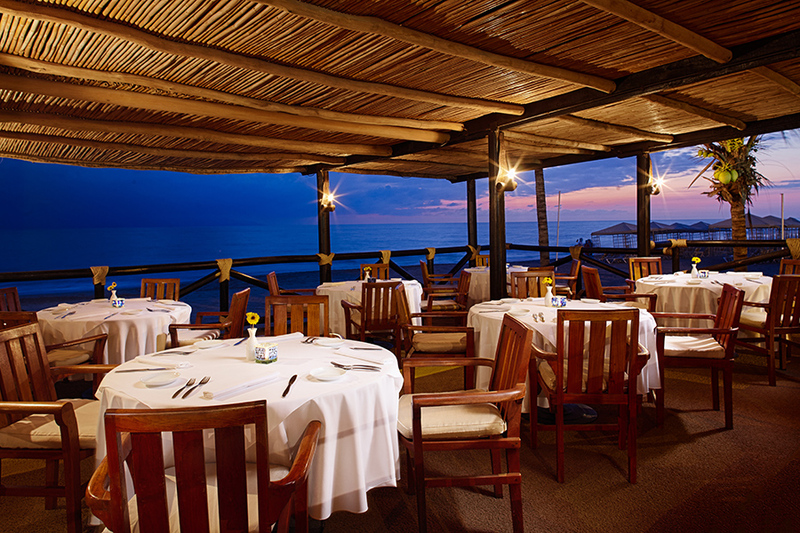 The restaurant is ocean front and enjoys a sensational view. Surrounded by the crystal-clear blue swimming pool and beautiful, tropical gardens, you will enjoy cool exotic drinks at the main pool while enjoying the beautiful view of Banderas Bay. For informal and fast service while lounging by the pool or enjoying a day of family activities, Velas Vallarta’s Snack Bar serves a variety of delicious snacks, such as pizzas, hamburgers, hot dogs, nachos, guacamole, and ice cream. The Snack and Ice Cream Stations are located in the pool area next to La Ribera Restaurant. Surrounded by the crystal-clear blue swimming pool and beautiful, tropical gardens, swim up to the Aqua Bar to enjoy cool exotic drinks at the main pool while enjoying the beautiful view of Banderas Bay. Relax with a refreshing cocktail, margarita, cerveza or nonalcoholic drink in the casual, open setting of the Alhambra Lobby Bar. Our lounge features live music and evening entertainment that will move you to the rhythms of Mexico. Enjoy the Mariachi band and the theme nights such as Mime, Casino Night, Pre-Hispanic Night, International and Mexican Night. 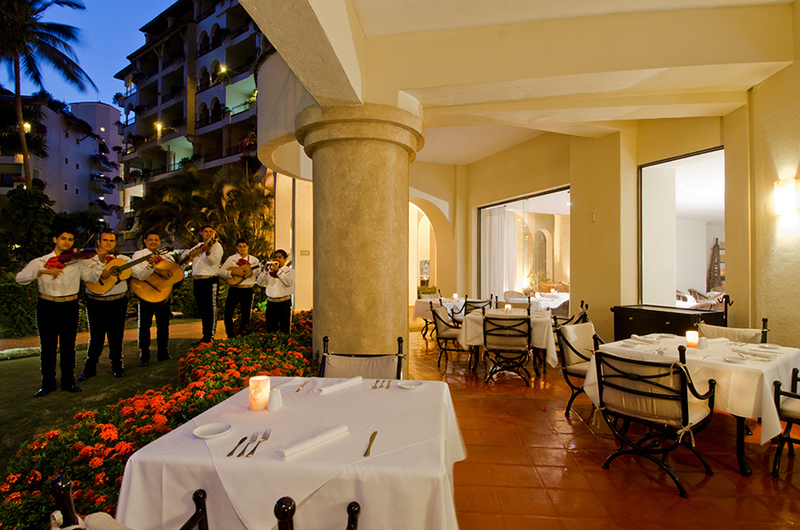 Our lounge features live music and evening entertainment that will move you to the rhythms of Mexico. Discover the ultimate spa vacation, a total balance of mind and body, in the tranquil ambiance of our Puerto Vallarta, Mexico spa. Enjoy a healing massage and rejuvenating facial that will soothe all your senses. Our luxurious spa features three indoor treatment rooms for massage, a hydrotherapy area, a sauna, a room for facials, and an intimate beauty salon where guests can enjoy complete hair care, style services, waxing and foot and hand care. For the ultimate in relaxation, visit our outdoor spa facility located on the jetty above the calm azure waters. 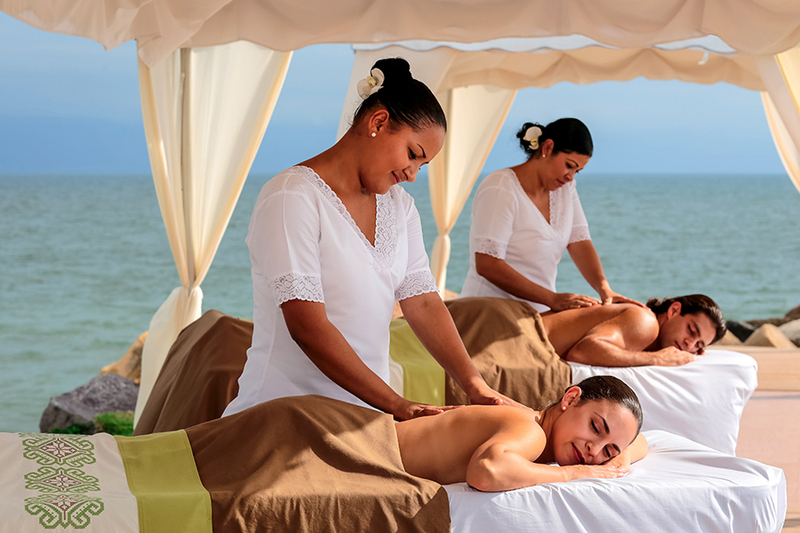 Experience a private massage right on our peaceful beach with the soothing sounds of the gently rolling waves. By request, spa treatments can also be enjoyed with a partner, together in the same room. 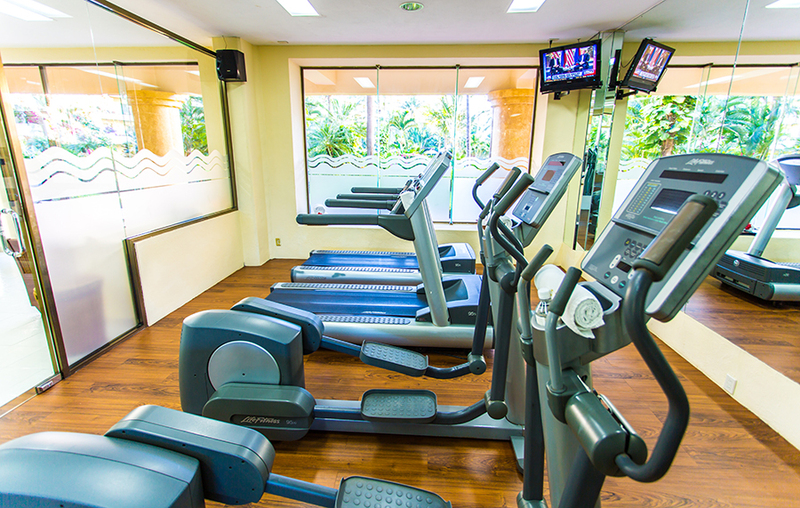 Fill your body with energy in our fitness facilities with the most advanced technology, equipped with training and exercise machines. The gym has a cardiovascular center with two treadmills, two elliptical trainers, a stair climber and two stationary bikes. Just minutes from Velas Vallarta you will find spectacular golf courses, including the Marina Vallarta Golf Club with 18 holes and practice facilities for beginning to advanced golfers. Vista Vallarta Golf Club is also very close, with two courses designed by Jack Nicklaus and Tom Weiskopf in an ideal tropical environment. Puerto Vallarta is the perfect family vacation spot, offering unlimited adventure and entertainment in a picturesque tropical destination. For adventurous souls, Puerto Vallarta has an abundance of outdoor activities, water sports, ocean excursions, and eco-tours. Experience the natural beauty of Vallarta by snorkeling, diving, whale and dolphin watching (seasonal), kayaking, sailing, deep-sea fishing, hiking, mountain biking, horseback riding, water slides at Aquaventuras Water Park, or visiting a turtle sanctuary. Enjoy a walk on the Malecón where you will find restaurants, cafes, bars and all types of fun. The downtown area also offers wonderful shopping and art galleries where local artists display their beautiful creations, as well as antique architecture, historical churches and vibrant traditional markets.